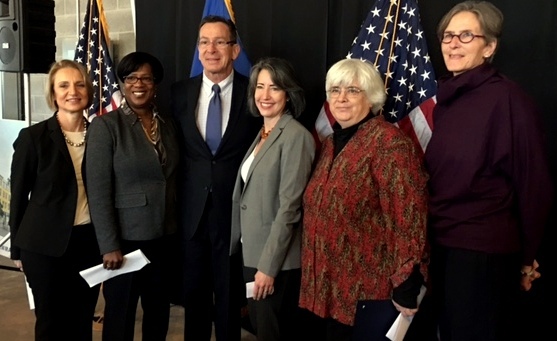 (HARTFORD, CT) – Governor Dannel P. Malloy today announced that with the state’s significantly increased housing efforts over the last few years and focused strategies to end homelessness, the State of Connecticut has reached new record levels and is able to connect every chronically homeless person in the state with permanent housing. Connecticut’s efforts on this front are leading the nation in bringing chronic homelessness to new lows. This announcement means that the state, in collaboration with its network of nonprofit community providers, has strengthened its housing system to the point that every person who has been verified as being chronically homeless has been matched to permanent housing, and whenever a new episode of chronic homelessness occurs, that person can be matched to housing within 90 days or less. The Governor today joined Connecticut Department of Housing Commissioner Evonne Klein, Department of Mental Health and Addiction Services Commissioner Miriam Delphin-Rittmon, and groups of housing advocates and local housing providers at an event in Meriden to highlight the milestone. Chronic homelessness is defined by the U.S. Department of Housing and Urban Development as someone who has been homeless for more than a year, has had at least four separate episodes of homelessness in the past three years that add up to a year, and has a disability. It is one of the most visible and costly forms of homelessness. These individuals tend to cycle in and out of expensive public systems such as emergency rooms, hospitals, and correctional institutions. Studies have shown that towns and cities can save up to 70 percent of these associated costs by addressing chronic homelessness. Data from UConn has shown that the average annual cost to the state for an individual experiencing homelessness is more than $33,000. Likewise, that annual cost grows to over $122,000 for a family experiencing homelessness. Thus, the Governor explained that these techniques to prevent and end homelessness are saving the state money. The second state in the nation certified by the federal government as effectively end homelessness among all veterans (February 2016). Since 2011, together with the Connecticut Housing Finance Authority, the state has created 9,037 affordable housing units with an additional 2,943 currently under construction, and funding commitments are in place to create another 5,200 affordable units. During that same time, the state’s investment in affordable housing has totaled over $1 billion. This investment, coupled with contributions from the private sector, amounts to over $3.5 billion of economic activity generated in the housing sector in just the past six years. For media inquiries, please contact training@cceh.org.